"Mundo Mo'y Akin" is GMA-7's one of the hit and top-rating Primetime TV series! It is supposed to be ended on the last week of June. But because of its consistent dominance in the TV rating race, the teleserye is extended up to three months more! The charm of Alden Richards, the unique role of Louise Delos Reyes as an ugly lady, and the comedy-maldita character of Ms. Jacklyn Jose as Dona Charito made the story well-loved by viewers! Therefore, the supposed to be ending becomes endless! And the conclusion definitely deserves to be called as the Beautiful Finale! 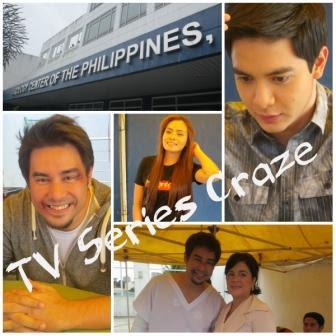 Last Tuesday afternoon, August 28, 2013, TV Series Craze along with the other entertainment bloggers had a set visit on the actual taping of "Mundo Mo'y Akin" in the Urology Center of the Philippines, Diliman Quezon City. The scenes were taken in the hospital and will comprise the remaining exciting episodes of the TV series. Actress Jacklyn Jose Sits Like Donya Charito Watching their Comedy Scene! Injured and Wearing Hospital Dress, Gabby Eigenmann Still Posed for a Picture! Aside from Alden Richards, Arny Ross, Gabby Eigenmann, and Jacklyn Jose, also present in the said taping were Angelika Dela Cruz and Louise Delos Reyes. According to Gabby Eigenmann, this episode is the aftermath, the fall-back of the Carbonel Family! Seems so exciting! The scenes will be some of the highlights of the series' beautiful ending!